For a copy of the flyer, click DissertationPrizeAnnouncement. This entry was posted in Uncategorized on June 28, 2017 by Katie Johnson. The Academic Research Institute in Iraq’s (TARII) mission is to promote scholarly research on and in Iraq and to strengthen relationships between Iraqi and American scholars and institutions. TARII is committed to ensuring that our Iraqi employees, fellows, and colleagues are able to engage in collaboration and ongoing research projects in Iraq and the US. In light of current developments, TARII pledges to continue to foster scholarship and build academic ties between the US and Iraq. إن رسالة معهد الدراسات الأكاديمية في العراق (تاري) هي دعم الأبحاث العلمية حول العراق وفي العراق، وتعزيز العلاقات بين العلماء والمؤسسات العلمية العراقية والأمريكية. يلتزم معهد تاري بضمان مشاركة موظفيه وزملائة العراقيين في المشاريع البحثية التشاركية والمشاريع الجارية في العراق وفي الولايات المتحدة. وعلى ضوء التطورات الحالية، يتعهد المعهد الإستمرار بتشجيع البحث الأكاديمي وببناء علاقات أكاديمية بين العراق والولايات المتحدة. This entry was posted in News & Updates on January 30, 2017 by Katie Johnson. This entry was posted in Uncategorized on November 15, 2016 by Katie Johnson. 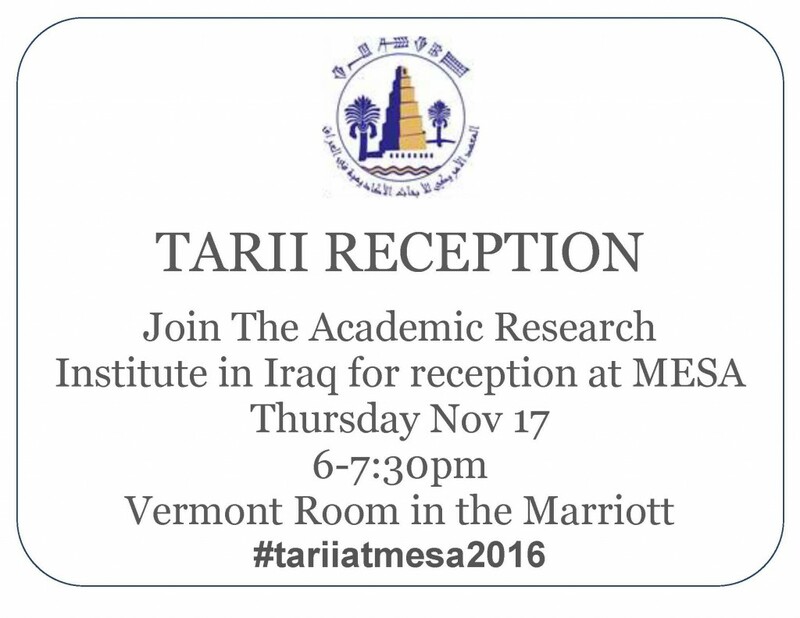 TAARII: though our name suggests that we are a research institute “…in Iraq,” it has been difficult to establish this fact since the fateful events of 2003. Only few of our members have been able to visit the country, and our fellowship program can only fund U.S. researchers who work on, but not in, Iraq. The project funding for Iraqi researchers in Iraq is TAARII’s pride, but only few Iraqis could secure a visa for travel to the U.S. Stateside, legal restrictions, the all too real threat of violence, but also perceptions about insecurity have led to an entire generation of Iraq scholars writing about Iraq without field experience, with exceptions few and far between. First contact, overcoming reservations, putting feet on the ground, and meeting people were therefore very good reasons for me to undertake a trip to the north of Iraq to participate in a conference-workshop on “Living Heritage in a Middle East in Conflict,” organized jointly by the Institut Français du Proche Orient (IFPO) in Erbil and the American University of Iraq in Sulaimaniye (AUIS). 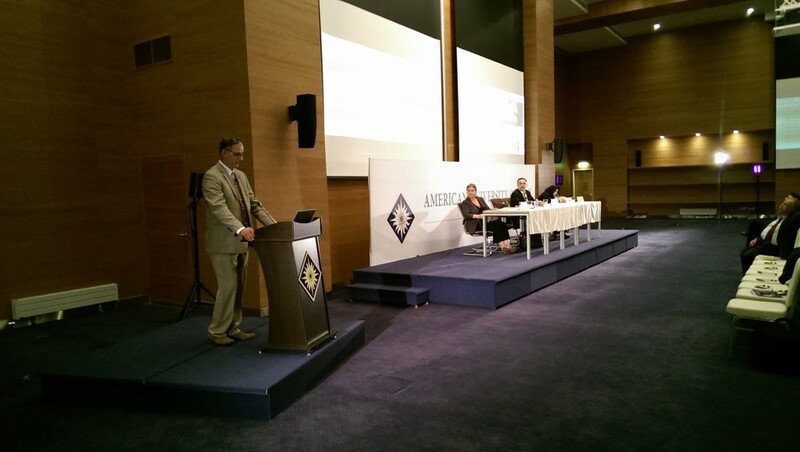 The conference took place on the impressive premises of AUIS from May 10 to 11, 2016. Nicely accommodated in a luxurious hotel named, aptly or not, “Titanic,” a group of researchers from the Middle East, Europe, and North America met for two days of intensive scholarly exchange. The “Titanic” is situated on the outskirts of the city overlooking the center and distant mountain tops, right next to an amusement park with a towering ferris wheel. A fifteen minutes bus ride along the ring road took us to the campus of AUIS with its state of the art conference hall, including simultaneous translation from and into Arabic, Kurdish, French and English. The University president and the co-sponsoring French institutions (the Institut Français, based at the French embassy in Baghdad, the IFPO, which maintains a branch on the citadel of Erbil, the Capital of the autonomous Kurdish region of Iraq) offered their greetings, followed by presentations by participants covering the entire Middle East region and beyond, including even reflections on the destruction of the Bamiyan Buddhas by the Taliban, and the impact of the recovery efforts on local populations (Constance Windham, Bert Praxenthaler). Discussions evolved around issues of cultural heritage destruction and its impact on social life, coping strategies of affected populations in Iraq and Syria, or the challenges to the preservation of living space, customs and linguistic heritage in the face of ongoing contestations of power and dominance between rivaling groups in the entire region, at the expense of local and minority identities (Alda Benjamen, Aline Schlaepfer, Mikhael Benjamin, Jean Lambert, Rafiq al-Akkuri, Jordi Tejel). Iraqi colleagues in particular bemoaned the loss of traditions of coexistence and collaboration that had dominated Iraqi social life in the past (Hassan Nadhem, Ghada al-Slik, Scheherazade Qassim Hassan, Mahmood Ahmed Bakr Khayat). Particularly interesting were presentations by AUIS professor Edith Szanto about the “rediscovery” of Zoroastrianism among the Kurdish youth as the “original” Kurdish religion as push-back against the rising threat of militant Islamism, by former TAARII fellows Bridget Guarasci on the pitfalls of post-Saddam reconstruction discourses as exemplified by the Iraqi Marshlands, Mosul archeologist Leila Salih’s discussion of the re-purposing of lost heritage site in her home town, former TAARII fellow Abdulameer Hamdani’s stock taking of the disappearance and dispersal of Iraqi ancient heritage since 2003, and Thomas McGee’s fascinating account of debates in the North Syrian Kurdish city of Kobane about the re-construction or memorial preservation of the destroyed city center after Kurdish troops re-took it from Daesh in 2015. 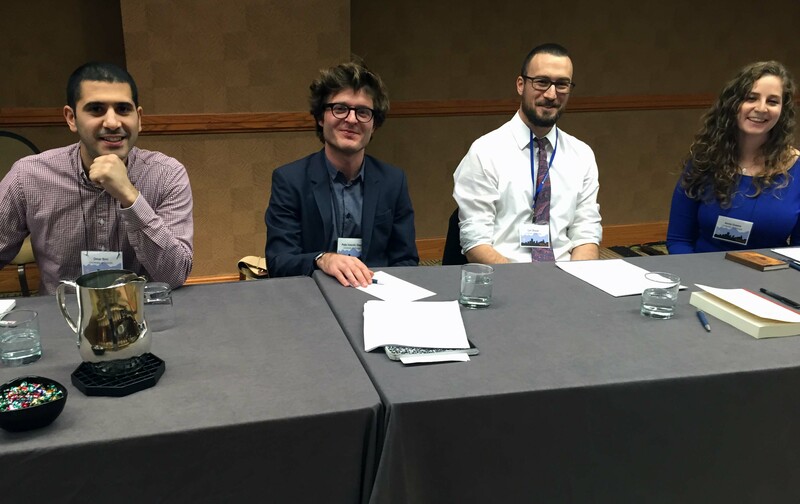 Accounts of the impact of the Syrian Civil war on cultural and social heritage were particularly chilling (Mustafa Ahmad, Mohamad Aljasem, Vanessa Guéno), while other presentations focused on possibilities of reconstruction, both materially and socially (Diane Duclos, Jala Makhzoumi). Conference organizers Géraldine Chatelard, Elizabeth Campbell, and Boris James steered questions and answers to cover issues related to political, legal and scholarly dimensions of the definition of heritage, and what the international heritage discourse can do to the life of communities. Interesting contributions to the discussion included Saad Eskander’s remark that it should not be forgotten that heritage destruction pre-dated the 2003 invasion and Daesh. Great parts of old Baghdad had fallen victim to Ba‘thist development plans, long before 2003. Altogether, the conference offered crucial insights to the variety of challenges that cultural heritage activists and practitioners are facing. The conversation is ongoing. Next to the proceedings of the conference, informal interactions and visits to nearby sites were especially inspiring. 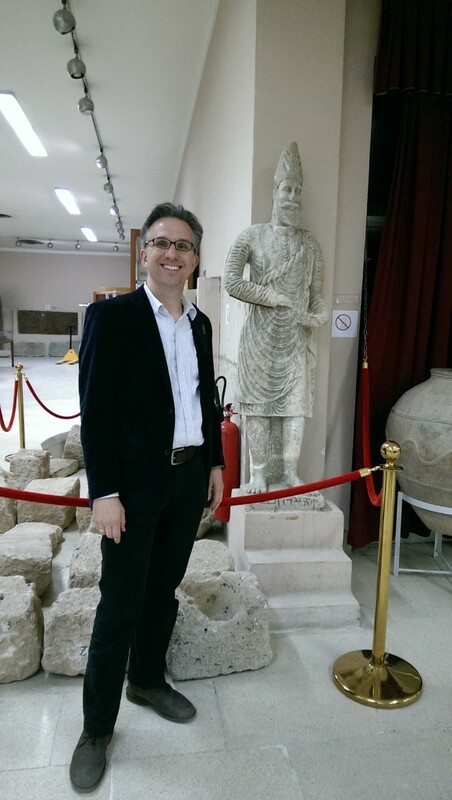 The Sulaimaniye Museum offered a glimpse of the past in several ways – first of all through its small but fine collection of antiquities, but also because of the composition of the museum’s artifacts stemming from all different regions of Iraq, at a time when the collaboration and interaction of Iraqi scholars across lines of sect and ethnicity were a simple fact of life. Iraqi archaeologists of all proveniences attended university together and worked in all corners of the country, as the director indicated, and they sometimes were allowed to take along artifacts to the local museums of their places of origin. I had decided to extend my stay for a couple of days beyond the conference, which offered me the opportunity to join French and American colleagues on an outing to the mountains and valleys around Sulaimaniye, and on an overland trip to Erbil, where I wanted visit the facilities of the Iraqi Institute for the Preservation of Antiquities and Heritage that is affiliated with the University of Delaware. The trip to the Kurdish mountains turned out to be a lesson in Kurdish public history and culture of commemoration of experiences of violence. 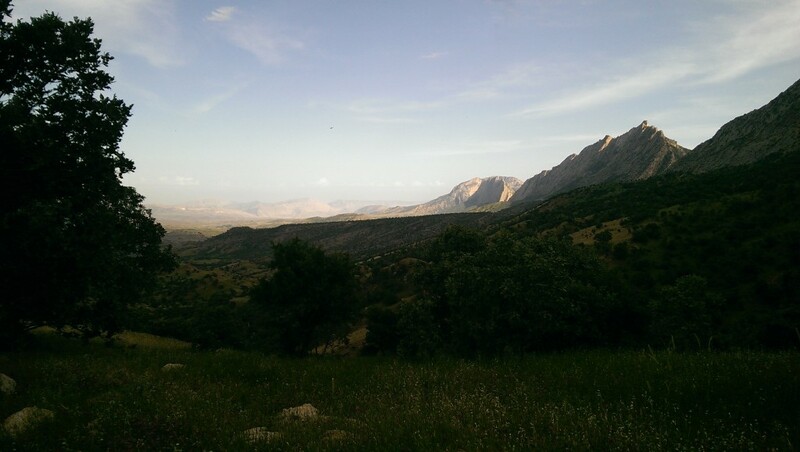 Florence, director of the French School in Sulaimaniye, her Kurdish co-director Razgar and his son Rawa invited us on a trip to get to know the comforts of a favorite Kurdish family pass time – a picnic in the fields and meadows at the foot of a mountain range. But this was not only about eating stuffed vine leaves and peppers, but also about reminiscing the killing fields of Kurdistan. Razgar turned out to be a Peshmerga veteran who had fought against Saddam Husain’s army in the Anfal campaign. During the massive sweeps and chemical attacks in the late eighties, he had held out among the impressive rock formations of the Qaradagh mountains that we were now marveling at in the midday sun. His unit had spent months in hideouts, reduced from a group of more than one hundred fighters to only a hand full, moving between positions and fighting pitched battles against Iraqi troops, watching helicopter gunships drop chemical weapons. The villages we passed through were mostly new constructions after having been bulldozed by the army. 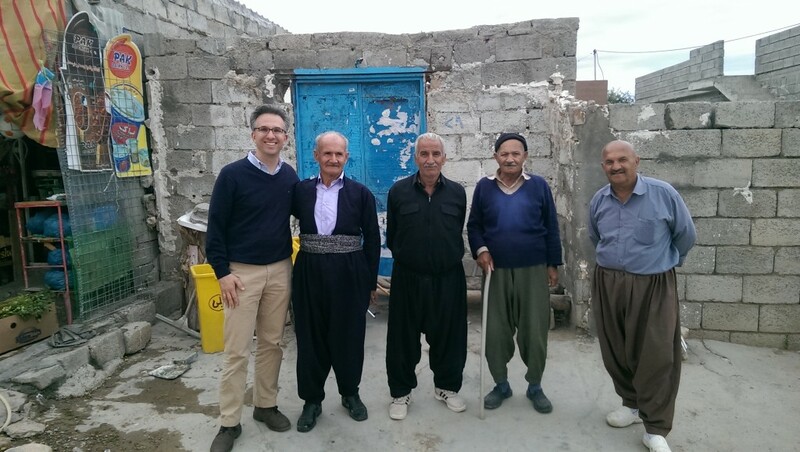 One Peshmerga, 16 years old at the time, had lost his entire family, but was now living again in his ancestral village with a new family, Razgar told us. He himself escaped and went into exile in France for many years. The intense and rough beauty of the landscape made it hard to believe that this place had witnessed horrendous crimes. The clouds of poisonous gas had risen and almost reached the mountaintops, he said, and then had slowly sunken down again. 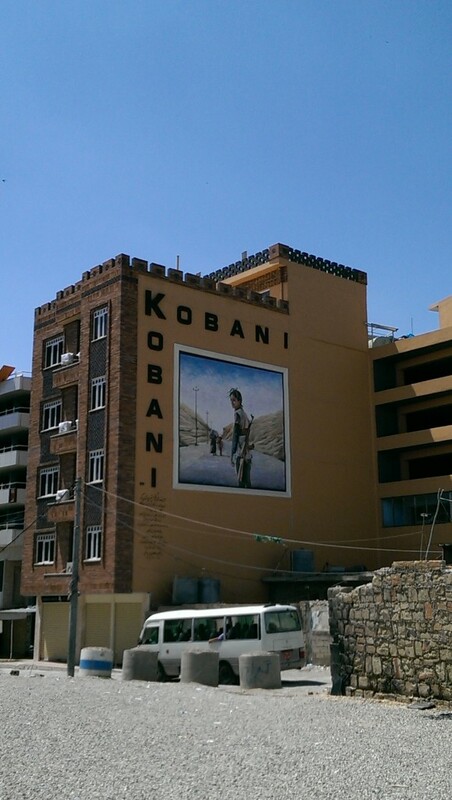 The history and present of war are omnipresent in the Kurdish mountains. 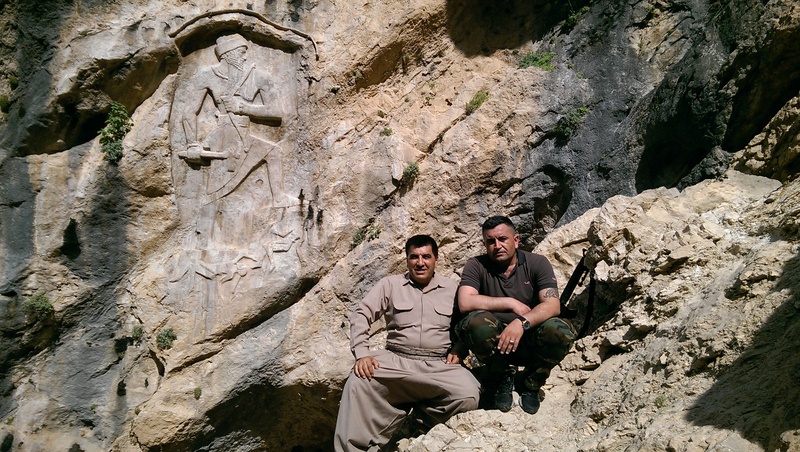 During a hike up to the Akkadian stone relief of Derband-i Gawir, which some say depicts warrior king Sargon of Akkad, our guides each shouldered their Kalashnikov and M16 rifles. We followed paths where Razgar and his comrades had descended into the valley by night to gather water and access cachets of flour and sugar, after staying in their hiding places during the day. The rifles, the stories, are certainly a chilling reminder of a violent past, but they are also part of the mis-en-scene of a memory culture with enormous legitimating power for the present. We continued the trip in our 4x4s to the Qopi Qaradagh, the tip of the valley and then back through a village where we greeted some elders and contemplated the martyrs’ monument. The latest of the martyrs’, whose images were not yet displayed, had fallen in the fight against Daesh. Razgar told us how he had helped injured veterans procure pensions from the KRG. He also told us of the foreign fighters from the US, France, Germany, Britain and other countries who came to join the Peshmerga against Daesh and who they sent on to Syria. The contrast between the eerily peaceful mountains of Southeastern Kurdistan around Suleimaniye and the suffocating heat of Erbil could not be stronger. The plains around Erbil lack the refreshing breeze and spring rains of Suli, and the burning of trash does its share to make Erbil’s air hard to breathe at night. The laid back atmosphere of Suli, a mid-size town, compares positively with the buzz of the Kurdish metropolis, the intense traffic and the bustling activity of the market. While it was hard to find a mosque in Suli, and one would rarely hear a call to prayer, both were omnipresent in Erbil. 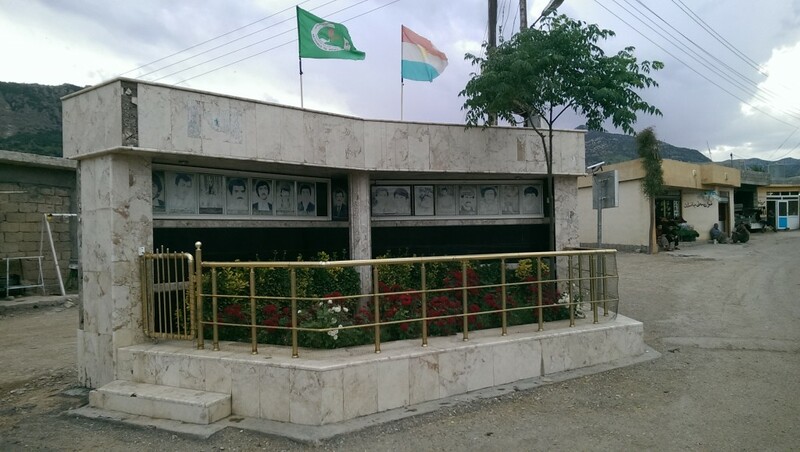 Seemingly, we had already entered a different country when we had crossed the border between PUK and KDP territory some distance before entering Erbil – an absurd situation: not only is one traveling supposedly inside the Iraqi nation state, there should also be inseparable brotherhood among the Kurds. But there we were, two sets of Peshmerga at a cold war style border post, in different uniforms, and the KDP side would not even consider the diplomatic passports of my French co-travelers sufficient to spare us a search of our luggage and some questioning. In the morning after our arrival my co-traveler Geraldine Chatelard and I visited the citadel, enjoying its mosque’s late 1950s modernist style renovation, contrasting with the historicist reconstruction of the main gateway to the fortress. In the modern western Orientalist’s quest for the “authentic” we also preferred the shabby Ottoman remainders deep in the bazaar at the foot of the citadel to the recently renovated representative parts opening to the streets and squares. The difference highlights the conflict between glitzy new renovations that are supposed to boost the town’s attractiveness for tourism on the one hand, and the care that preservationists want to put into Iraqi heritage, a goal that a new generation of Iraqi practitioners and scholars shares with foreign specialists. Both sides have a home and gathering point in the Iraqi Institute for the Conservation of Antiquities and Heritage that uses the old Erbil public library building outside the walls of the citadel. Brian Lione, the Institute’s managing director, gave us a tour of the labs and classrooms, as well as of a mud-brick production and building facility in the backyard that offers instruction in ancient construction techniques to the attendants of the Institute’s regular workshops, who come from all parts of Iraq to learn the necessary skills for a challenging job in a war-torn country. One of the highlights of the stay was a visit in the afternoon of the same day, before my departure back to the US, to Sinem Khanoum, an old Kurdish lady and friend of Geraldine, who belongs to a generation of Iraqis, which is about to disappear. She has an intellectual and political family background of Kurdish nationalists with a strong sense of inter-communal Iraqiness. She spent her life in Damascus, Baghdad, Kirkuk, Erbil, and Paris was probably somewhere in the mix, too. Her father had studied law in Leipzig, Germany, in the 1920s, her late husband had been in the oil ministry in Baghdad. Sinam Khanoum had fond and nostalgic memories about the old days when the communities were living together in the Iraqi capital up until 2003, but also about a meeting with the charismatic Kurdish leader Mullah Mustafa Barzani in the 1970s. 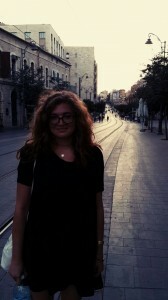 After a dinner of Kurdish barbecue in a café at the foot of the citadel, I departed to the airport. Different from the makeshift terminal hangars of the international airport of Sulaimaniye, the Erbil facilities are built to impress as this is supposed to be a shiny new gateway to and from what was once meant to be a new Dubai in Iraq. That dream has fallen victim to the decline in oil prices, the corruption and the mismanagement that have left the economy of the Kurdish region of Iraq a shambles. Inner-Kurdish conflicts linger under the surface, but one can sense the people’s pride and resilience as well. Observations and impressions of a short visit remain superficial, but hopefully the establishment of closer links between TAARII and the scholarly communities of all of Iraq will open channels for beneficial cooperation and mutual learning in the near future. This entry was posted in Conferences, Images of Iraq, News & Updates on October 19, 2016 by Katie Johnson. This entry was posted in News & Updates, Research on July 27, 2016 by Katie Johnson. Yesterday in Istanbul, Turkey, during the afternoon of the last day of the 40th session, The World Heritage Committee added eight new sites to the UNESCO World Heritage List. 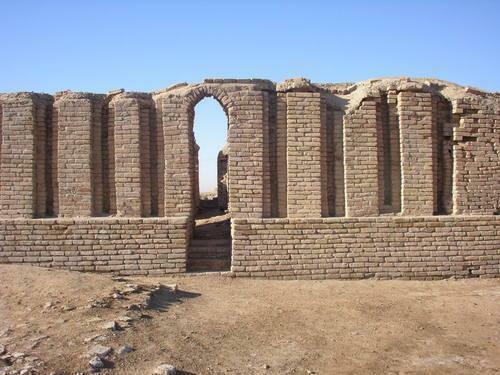 Among the added sites is the Ahwar of Southern Iraq: Refuge of Biodiversity and the Relict Landscape of the Mesopotamian Cities in Iraq. A Marsh Village in 1974. The marshes are located where the Tigris and Euphrates Rivers meet. Despite being home to the Madan, or Marsh Arabs, as well as host to many different types of flora and fauna, the marshes have been continuously depleted for various economic and political reasons. The population dropped from an estimated 500,000 in the 1950s to a mere 20,000 and the total area was greatly reduced. However, following the 2003 American invasion, many of the dams were destroyed and the United Nations Environment Program (UNEP) did much to help restore the marshes. The Mesopotamian Site of Ur. 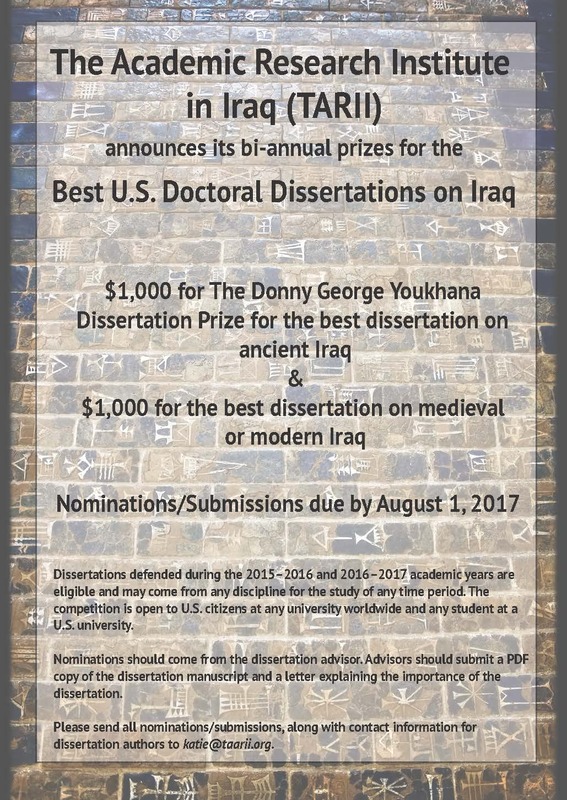 This entry was posted in Archaeology, Field Research, Images of Iraq, News & Updates on July 18, 2016 by Katie Johnson. This entry was posted in News & Updates, Research on June 13, 2016 by Katie Johnson. 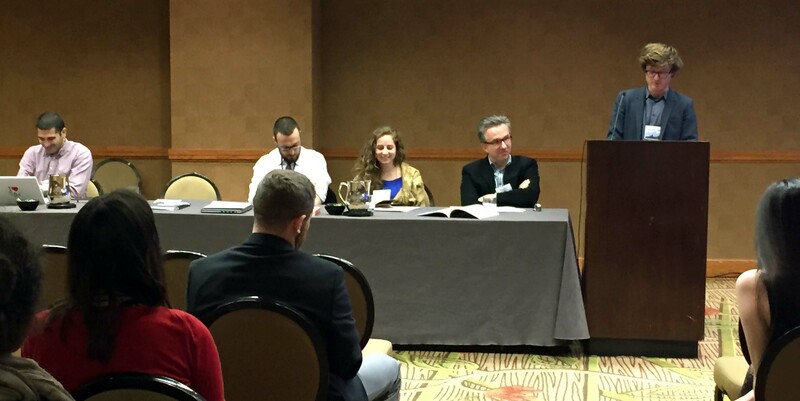 This entry was posted in Conferences, Research on June 7, 2016 by Katie Johnson. Elizabeth Rauh, History of Art, University of Michigan, received a TAARII US Research Fellowship for 2015 for her project Weapons of Creation: Art Practice and Production in the Contemporary Middle East. Elizabeth Rauh’s dissertation project examines how artists in the contemporary Middle East harness material violence into productive and creative art practices, which often interrogate historical art methods and materials. Rather than historicize modern art in the Arab World and Iran as derivative or “hybrid” styles and aesthetics, Rauh will explore the material and visual elements of art objects through close formal analysis to unpack the artistic processes of modernity in the region. One of her primary case studies is Iraqi artist Hanaa Malallah (b. 1958). Malallah’s monochromatic paintings (1980s–today) transform the destructive process of burning into an additive process on the canvas plane, thus revealing and reveling in the destructive aspects of art modernism and its colonial imbrications. Malallah’s art career attests to the dynamic Baghdad art scene while reflecting that art world’s dispersal due to ongoing warfare. Rauh will study Malallah’s artistic method collaboratively with the artist in London, while gathering vital information from her personal documents as well as herself as a living archive of the Iraqi art community and Institute of Fine Arts operating under Saddam Hussein and later foreign invasions. Rauh’s project will contribute to scholarship on Iraqi art history by locating art objects and practices in their specific regional contexts, while simultaneously positioning these art works as catalysts that complicate and upend discourses and interpretations of modern art on a global scale. This entry was posted in Fellow Updates, News & Updates, Research on May 30, 2016 by Katie Johnson. Clarence Moore, Political Science, University of Wisconsin-Madison, received a TAARII US Research Fellowship for 2015 for his project Tribal Alliance Behavior in Iraq. 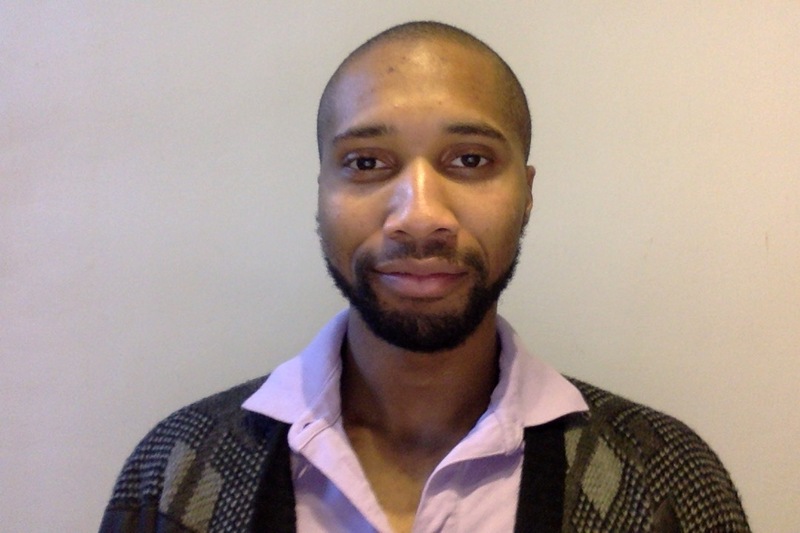 Clarence Moore’s dissertation asks: under what conditions does violence against civilians reduce popular support for violent actors and their causes? In addition to asking how violence influences support for outcomes such as religious government and democracy, Moore ties political orientations to tribal alliance behavior in Iraq. He proposes that because tribal leaders resist control by outsiders and draw their authority from popular support, tribal alliance behavior is a process based on sectarian geography, coercive violence by insurgents, and civilians’ and tribal leaders’ reactions to that violence. Though academics and policy analysts agree that many Sunni Iraqi tribes had turned against militants by 2007, there is currently no explanation of why some tribes switched sides and others did not. To answer this question, Moore will complete fieldwork in Amman, Jordan. He will use semi-structured interviews and surveys conducted with Iraqi refugees to develop a typology of violence and sort regions of Iraq according to the type and scale of violence they experienced. This information will allow him to assess the relationship between location, violence, and alliance behavior. This entry was posted in Fellow Updates, Field Research, News & Updates on May 24, 2016 by Katie Johnson.